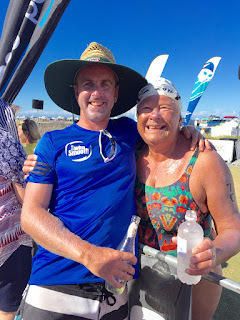 Rotto 2016: The View From The Pointy End Of The Field ~ Feel For The Water! Advice & Tips to Improve Your Swimming. 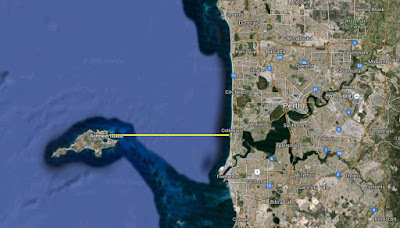 Cottesloe beach in Perth to Rottnest Island. Rottnest Channel swim at 70 years young. We had 70 swimmers from the Swim Smooth Squads and 1-2-1 session undertaking the Rotto swim this year, putting in some amazing performances between them - I'm so so proud of each and every one of them. I haven't got time to go through each in this post - you can check out the full squad blog here for that. We're incredibly lucky to have such a world class open water swimming event right on our door-step. Even though I wasn't racing this year I'd have to say it was probably my favourite year so far. The conditions were stunning but as usual a current around the island caught a few people out. This was running very moderately from north to south up until about 10.30am and then switched to a much stronger south to north current after this point (at least according to the information I was receiving at m2.mapswim.com/rotto.php). This made for some tactical racing at the front, which really added to the excitement. One of the last waves gets underway at the start. Brad's Race for the Win! I want to talk a little about a guy called Brad Smith who I've been coaching for the race this year. 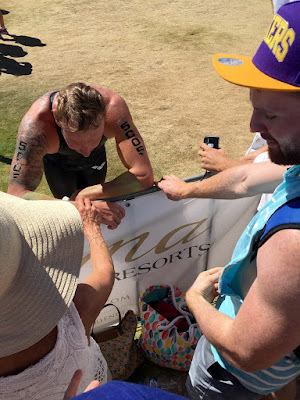 Never have I been quite so inspired by someone's deep-seated conviction about winning a race and to do all that is humanly possible to achieve that goal, as I have in coaching Brad. I first met Brad when he smoked me clean of his heals at the 2014 City Beach 10km open water swim. This was my first event after back surgery and I'd never heard of this young 24 year old super-fish before. We paced it out for the first couple of Ks side-by-side, stroke for stroke until he clearly got bored with that and into a massive swell, left me for dead! Incredible - I thought I was swimming well but he annihilated me by 12 minutes! At the next event (Coggee 5km) I had buckled my belt and finished directly behind Brad just 0.5 seconds back. Clearly I'd won his respect with this change of pace (!) 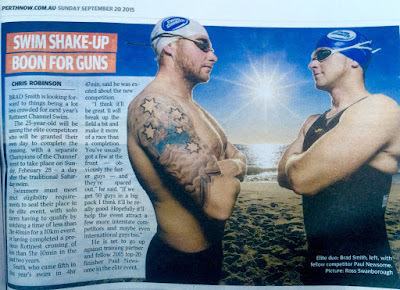 and for the 2015 Solo swim we subsequently became great training partners. Brad went on to finish 5th in 2015, with myself a good way back in 10th. I was impressed. On the ferry back to Northport, Brad told me how he wanted to win the event in 2016. He had planned to do the majority of his swimming with the Breakers swim club, and asked me to write his overall program and generally oversee what he was doing to keep him on track. He said he wanted to start the following day! Whereas most take off a couple of months for some well-needed R&R, Brad was deadly serious - he wanted the win and he wanted it bad! And so we started on the mission of trying to win the 2016 race. Back in September, when the Champions of the Channel event was announced, Brad was interviewed about his ambitions and they featured us giving a grimace to each other down at Cottesloe Beach. Little did we know then just how close he'd come to winning the event! After a brilliant 12 months preparation where precious little went wrong and Brad managed to swim a 10km open water event at Sorrento Beach in exactly 2 hours despite having already swum a hard 8km ocean swim immediately before for his "warm-up". He was ready! And so to race morning… Watching things unfold from Brad's support boat, the plan was always to go out steady. Brad's main concern were the competitors Lars Bottelier, Lachlan Tassell and Jaime Bowler, who ended up finishing 14 minutes, 15 minutes and 22 minutes behind Brad respectively come the finish line. The interesting thing was that up until the 10km mark (half way), Brad was behind them all! team) requires a support boat and paddler. We had planned to hold steady until the 12km mark and then let it rip. As it happened, an 18yo competitor by the name of Ben Freeman who wasn't listed on the official start list for that particular wave, had gone off like a scorched cat and was at this point over 350m ahead of Brad (I was using a range finder to determine the distances between all his competitors and keeping Brad informed). After a little research it turned out that Ben is the youngest ever Australian to complete the 34km English Channel swim, having done so in 9h10m in 2015, so we knew he had the goods and the staying power. He's also been mentored by English Channel World Record Holder, Trent Grimsey (6h55m!). Once this intel was in, I knew we could not let this surprise competitor get any further ahead, and so we announced "war" a little earlier than we had planned. Brad went from 4.5km/h in the early stages, to 5.1km/h and finally held 5.4km/h for the last 5km. It was an incredible show of pacing. Brad had started out within the group that contained the duos (relay teams of 2) of Tim and Ben Hewitt, and Jeremy Brook-Smith and Gareth Evans, but was left by this group at about 2km. 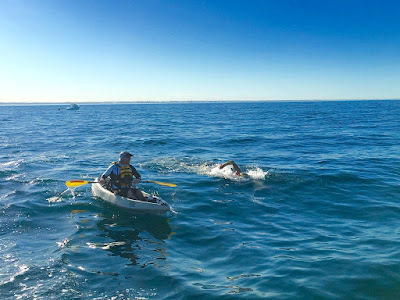 To show Brad's incredible resilience and performance that day, despite the fact that two of these swimmers have won Rotto solo on numerous occasions, you'll imagine my coaching delight when we started to catch them all back at 16km and then blow past the two duo teams. It was incredible! Brad puts in his big surge in the second half of the race. 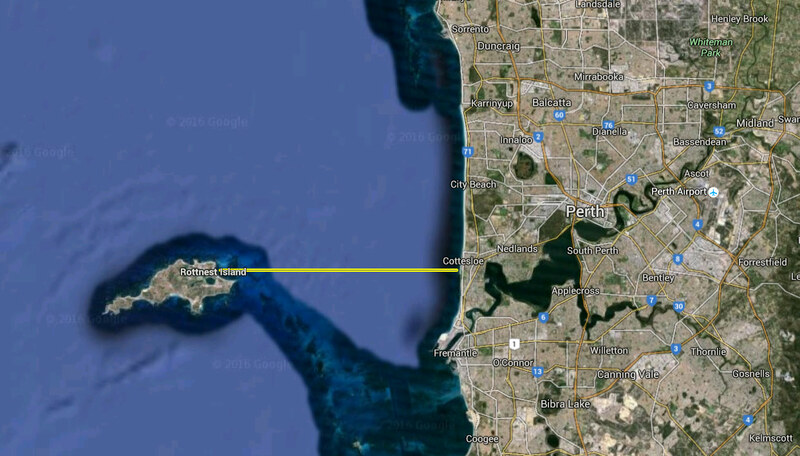 I'd been watching the currents all morning and whilst Ben Freeman in first place had drifted slightly south of the Rhumb-line, I could see that the current was running north to south at this point. We made the decision to press slightly north knowing it'd swing us in during the final couple of KMs. This is where we started to make up some big ground on Ben, going from 350m behind to just 30m within the space of 4 or 5km. Brad's strength and his boat skipper's prowess on the helm started to muster up a charge like I've never seen before, nor doubt I will ever again. It was breath-taking and so, so exciting! Sadly Brad didn't quite get there and credit to Ben Freeman, he held his own and ended up extending the gap to Brad in the final KM by about 110m. So, so close! I predicted Brad would go 4h20m, but was slightly off in my predictions - he went 4h20m01s! Needless to say Brad was hugely disappointed. It was a brilliant performance and nothing more could have been done. Sometimes you give absolutely everything and it's still not enough but Brad will be back. When asked if he felt we'd left his charge too late, Brad responded no, he'd have blown up sooner. Should he have gone out harder? No, he'd have blown up much earlier. To put 14 to 22 minutes into your rivals in the latter half of this event is amazing. It shows patience and strength like no other. So next time you're contemplating a long distance "whatever" try to be more like Brad. It takes patience and courage and it doesn't always pay off, but I truly believe that Brad got absolutely everything out of himself that day and I couldn't be more proud as one of his coaches and mentor. Cheers everyone, here's to Rottnest 2017 and giving your all in your races! Brilliant! Well done to both of you and thanks for the inspiration, both for coaching and competing. Tim.